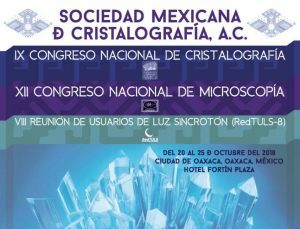 Congress organized by the “Sociedad Mexicana de Cristalografía”. A fine opportunity to explain our diffraction experiments at the Elettra Sincrotrone (Trieste, Italy) with the Group of Profs. Luis Fuentes and María Elena Montero (CIMAV, Chihuhua), together with the studies on the structure of lead-free piezoceramics with Prof. María Elena Villafuerte-Castrejón (UNAM, CDMX).